Bolens mowers are manufactured by the MTD company. The Bolens mower line represents an entry-level mower for MTD. Typically sold at large home improvement outlets, these mowers were built with price in mind. Engine options are limited. In fact, a standard side valve Briggs and Stratton engine is the only type available. This is the ‘classic’ Briggs engine used for decades, with a foam type air filter. All of the models available currently are equipped with a simple blade brake system. 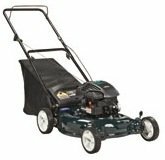 The model 074E is a dedicated side discharge, reminiscent of rotary mowers made in the 1970’s. The cutting height is adjustable, but the wheels need to be removed from the deck and placed in different holes to change the cutting height. The model 414A has the option of rear bag or mulch. Adjusting the blade cutting height is accomplished with the use of a spring loaded lever at each wheel, so the wheels do not have to be removed. The Bolens brand serves as the low cost option in the MTD line. For those consumers who do not need a mower loaded with features, or for those looking for a very economical mower, this machine could be for you.